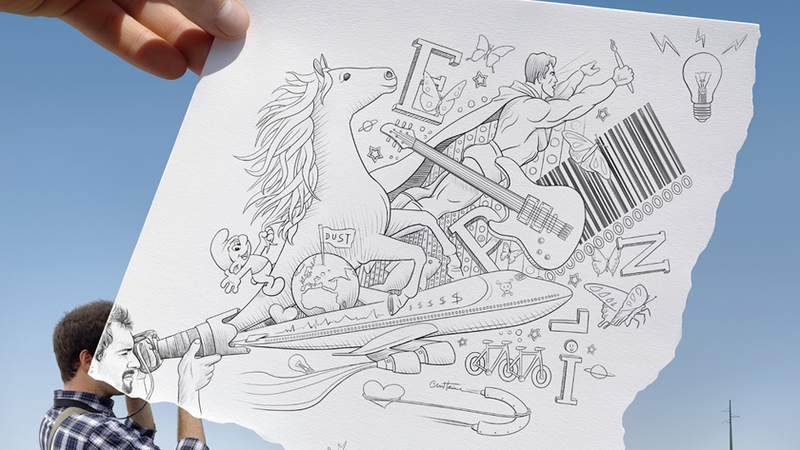 Ben Heine’s interests have always been eclectic. As a boy, he explored everything, from drawing, painting, and writing poetry to music and athletics. He earned a degree in journalism, but chose to follow his passion for graphic arts. He eventually added photography to his repertoire because it empowers him to create images that are more eye-catching, dramatic, precise, and realistic than most paintings or illustrations. Today, Heine is equal parts artist and photographer, creating commissioned works for clients such as McCann Erickson and Diesel, while still making time for personal projects. 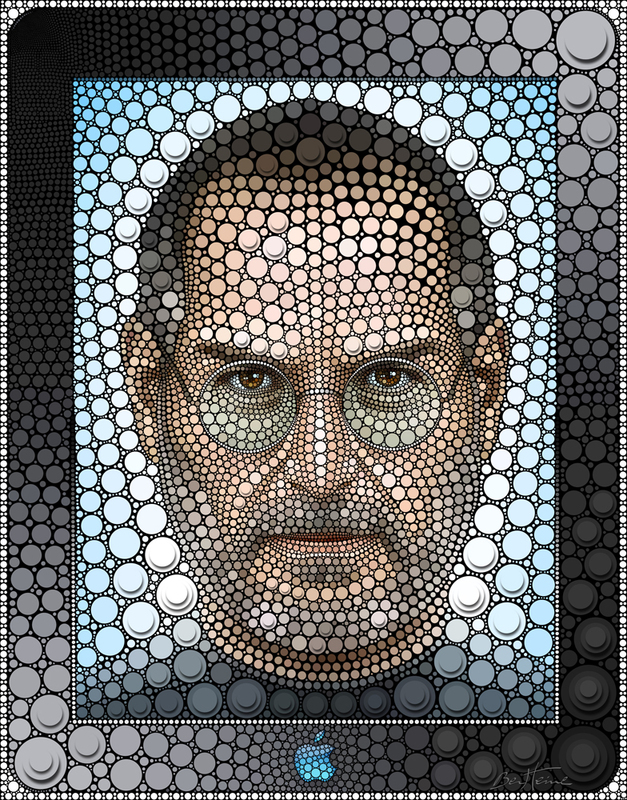 His Digital Circlism series, for example, features portraits of celebrities such as Elvis Presley, Steve Jobs, and Lady Gaga, created completely from tiny circles, while his Pencil Vs Camera project blends photos with illustrations in surprising juxtapositions. In the end, his images are like paintings and he signs each one, just as he would a traditional piece. 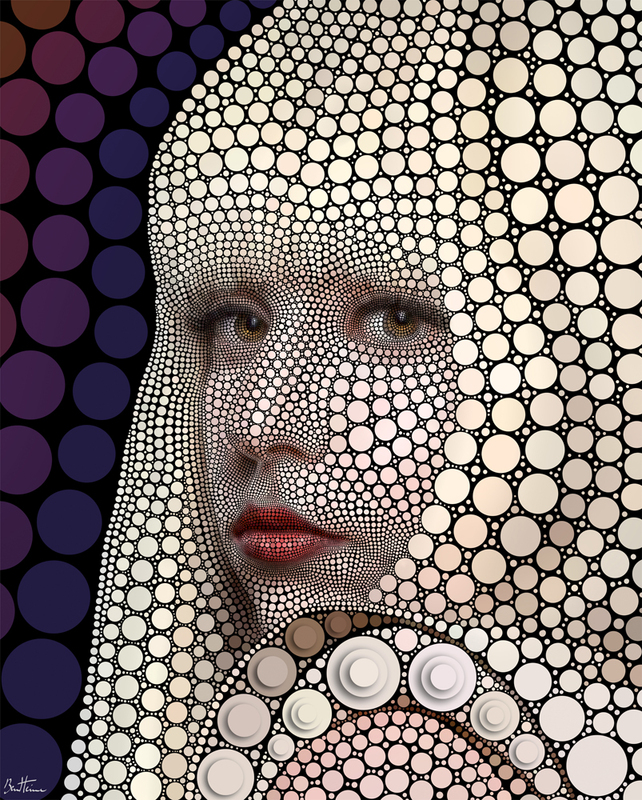 Here, Heine offers Photoshop.com a glimpse into his imagination and process. Ben Heine: My computer, software, and the Internet are the connections among all my activities as a creative person. Adobe® Photoshop® software is essential too. I love the fact that Photoshop enables artists to control every aspect of their expression in the context of a friendly interface. 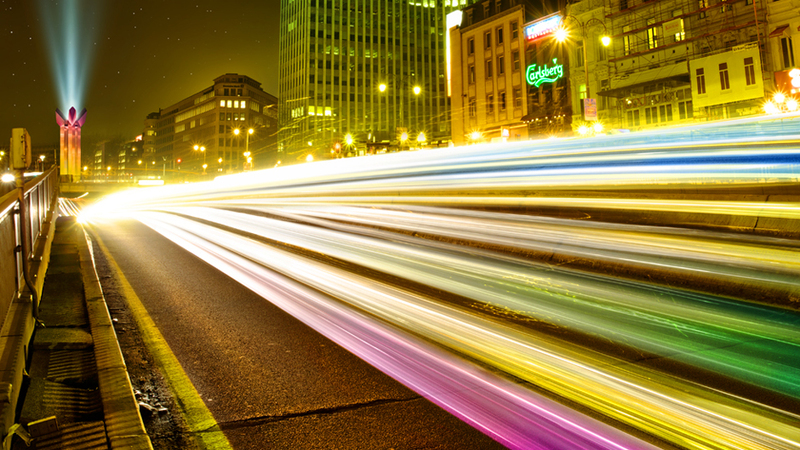 It’s the software that extends my imagination, allowing me to boost the content and the form of any picture. There is no limit to the creative potential of an artist and the magic they can create with Photoshop. Photoshop.com: You have studied art, painting, sculpture, and journalism—and are self-taught in photography and drawing. Which one was your first passion and why? 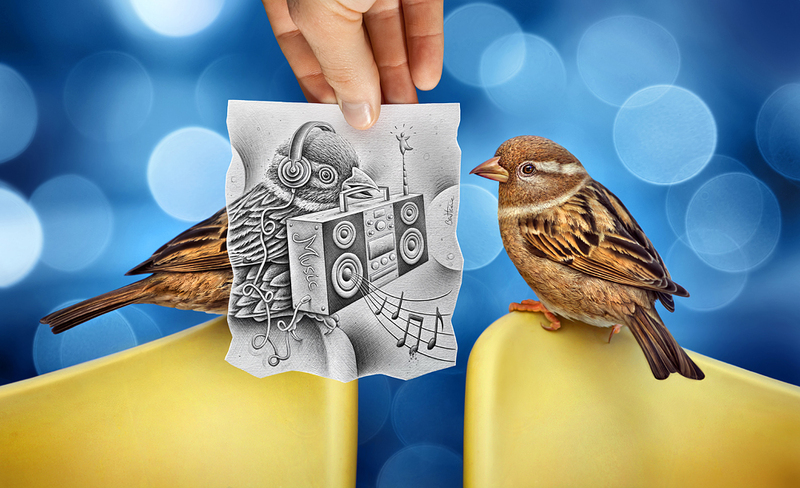 Ben Heine: Drawing was my initial obsession and my first love, because it’s easy to carry a pencil and a piece of paper. I used to draw all the time, everywhere. I needed to draw to express my emotions. Painting was the transition between drawing and photography. 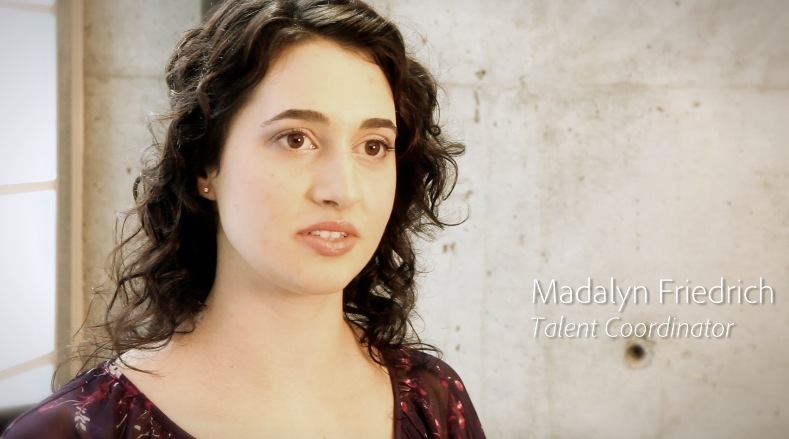 I studied Journalism for fun, but unfortunately working in an office just didn’t suit me. Photoshop.com: Was there a defining moment when you knew that it was time to become an artist professionally or was it a gradual transition? Ben Heine: It was a gradual evolution. I realized very early in my life that I would spend a huge amount of time and energy working on visual projects. I never sought to become an artist specifically or to conform to what it might mean to be an artist—it’s just the closest descriptor for what I am. Photoshop.com: What role does Photoshop play in your artistic process? 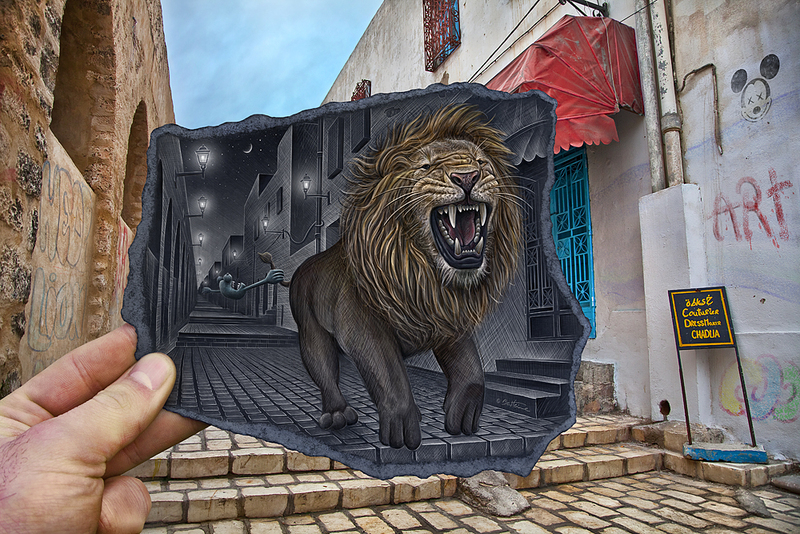 Ben Heine: I use Photoshop in my photographic and illustrative work on a daily basis. I see Photoshop as a modern and far more sophisticated digital version of the old photo enlargers that photographers used in darkrooms when analog photography was the most advanced technology available. Personally, I believe Photoshop is the best graphic tool to help me improve the quality, value, form, and content of my pictures. Let’s be honest, what cameras can do nowadays is mind blowing, but nothing compares to what Photoshop can do. A photograph from a camera will show you the Eiffel Tower exactly as it is. But with a bit of imagination and the help of Photoshop, an artist can transform the same subject, such as a montage depicting an upside down Eiffel Tower in the middle of a jungle with dancing giraffes in the sky. Photoshop is the tool that enables me to bring more meaning and originality to an otherwise random or insignificant photo. 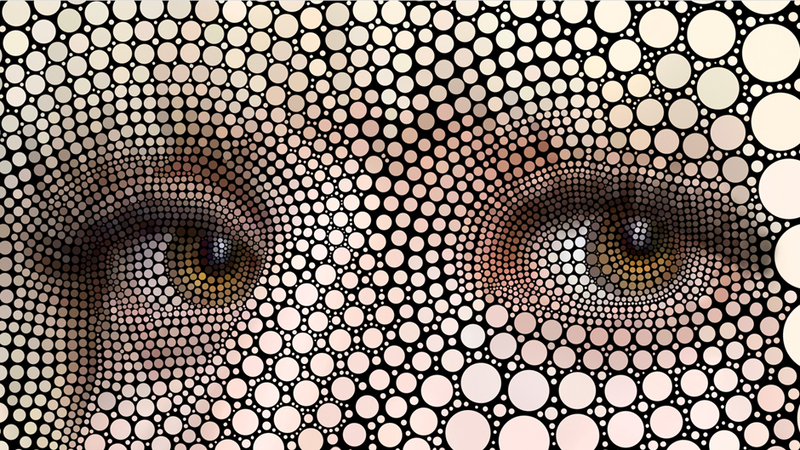 Photoshop.com: What are your favorite features in Adobe Photoshop CS6? Why? 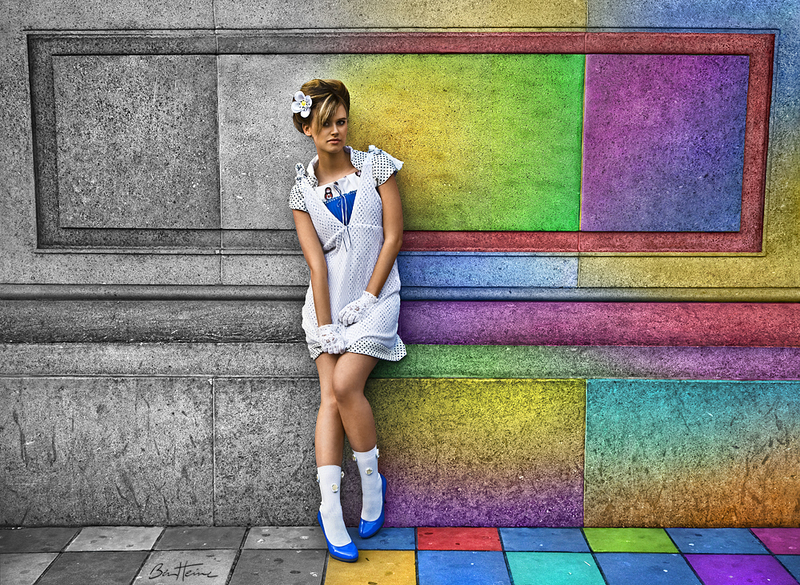 Ben Heine: The new Blur Gallery is a great addition because I use blur effects frequently. I also love the enhancements in the freshly refined interface, including a very easy and intuitive adjustment panel, and clearer and more visible control buttons. The dark background of the new interface is an excellent idea because users can now focus more easily on what's really important—the image itself. Finally, the top of the top for me is the instant-recovery option so I can worry less about working with large files. Photoshop.com: What are sources of inspiration for you and your work? Ben Heine: Mainly nature and people. Nature represents a divine energy for me. I spend several hours a week walking in forests, parks, and natural places to fill my creative well and take time to think about my future projects. Animals are a great inspiration too. I love to portray them in my drawings. I am also fascinated by interactions between people. I love observing them and getting inspiration from their actions and decisions. Photoshop.com: How did you get the idea to mix drawing and photography in your Pencil Vs Camera series? Ben Heine: The idea came while I was watching television and writing a letter at the same time. Reading my letter before putting it in an envelope, I saw the television screen behind the thin transparent paper. I then realized it would be great to create this illusion on a single surface, something that would show two complementary actions, each action being depicted by a distinct artistic tool (pencil and camera). I really wanted to find a way to blend photography and drawing distinctively but harmoniously in a single picture. I went outside and drew Pencil Vs Camera - 1, a very simple and minimal drawing. In my other Pencil Vs Camera images, I tried to bring in more meaning by adding weird and surrealistic elements on the paper to contrast more with the realism of the photo. The latest innovation in the series is the introduction of black paper instead of white paper. Photoshop.com: How did you create the Pencil Vs Camera - 55 image? 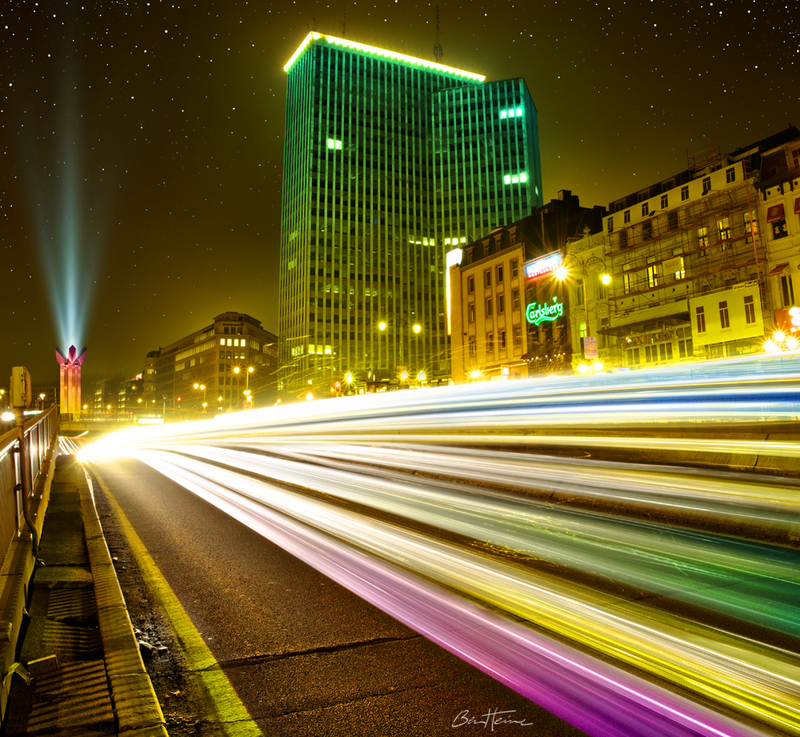 Ben Heine: This image was made near Braives’ church located in the Belgian province of Liège featuring my friend Davide Gentile, an Italian film director, holding a camera with a huge lens. In this instance, as the sketch is not too complex, I made the drawing at the chosen location, rather than at home. When the sketch was completed, I took a picture of it, holding the piece of paper in my hand. I can achieve similar results with digital tools—by doing a sketch in Photoshop, for instance. For this approach, I work using my digital tablet and manipulate the Photoshop brushes to give the illusion of a traditional drawing. 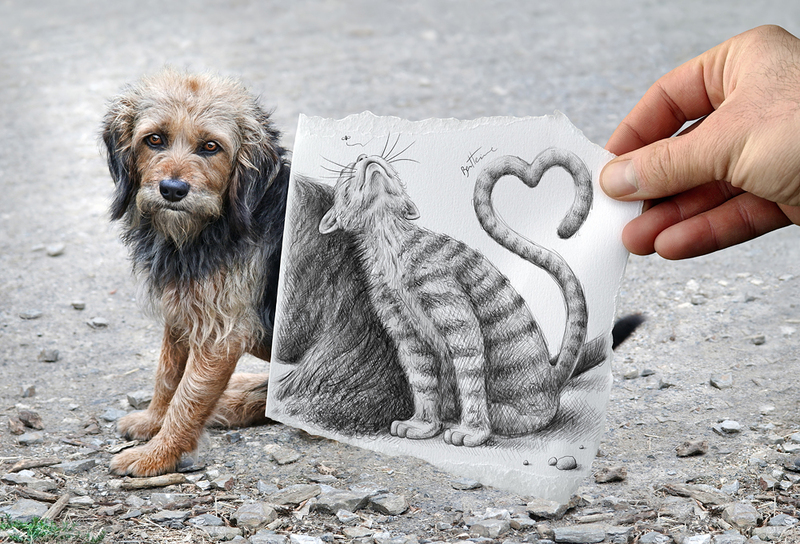 Pencil Vs Camera – 58, another picture in this series showing a cat in love with a dog, is an example of one of my digital drawings. In both cases, the sketches are always handmade and both methods are time consuming, involving work and creativity. Photoshop.com: Describe a favorite image you’ve created and what grabs you about it. 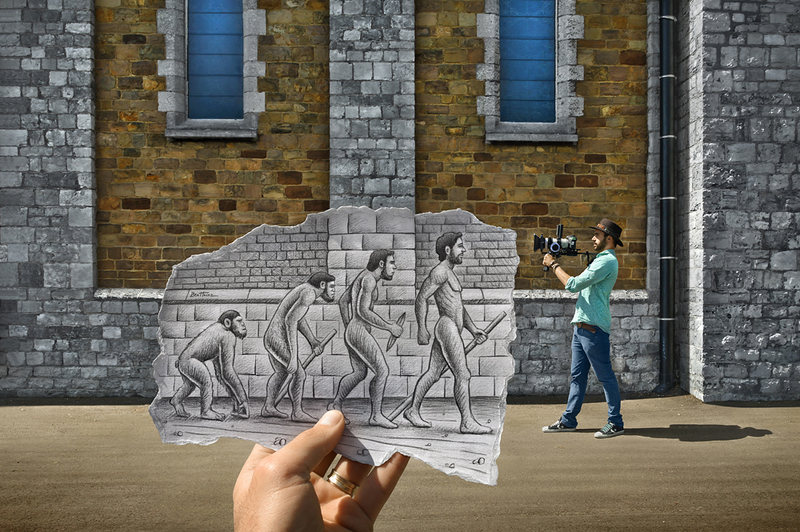 Ben Heine: I like Pencil Vs Camera – 63 very much because it’s in color, one of my recent improvements in the Pencil Vs Camera series, and because it’s powerful and still looks unfinished somehow. I also like Pencil Vs Camera – 30 because it symbolizes the whole concept of the series. The main character on the paper is holding a camera that is throwing out many symbolic objects. There are six hidden letters in the sketch composition: P – E – N – C – I - L. The viewer doesn’t know really which medium is actually doing the magic, is it the camera or is it the pencil? 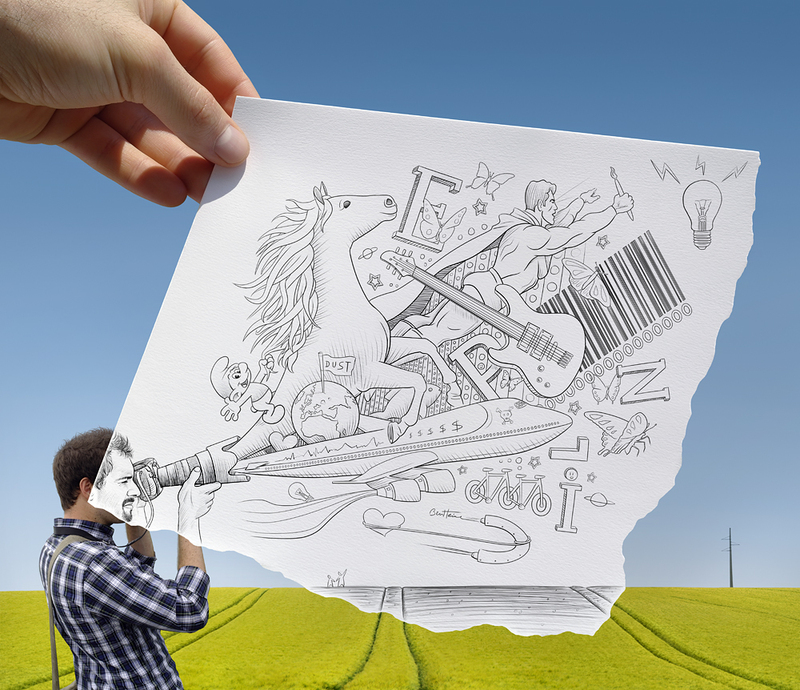 I think this image is a good metaphor of Pencil Vs Camera, which is all about illusion, 3D, dreams, augmented reality, and fantasy. Photoshop.com: How have you evolved as an artist? Ben Heine: There is a clearly noticeable progression in my development. I started doing very simple visuals and my work became more complex and time consuming in the recent years. My leitmotif is to push boundaries and do innovative art. I like to live every creative moment intensely. I always want to renew my goals and find new challenges. It’s also important for me to constantly follow new directions and not be afraid of criticism. I need to surprise myself if I want to surprise the people who follow me. Photoshop.com: You have several original series that showcase new viewpoints with Pencil Vs Camera, Flesh and Acrylic, and Digital Circlism. What’s next for you? Ben Heine: That’s the big question. Pencil Vs Camera is almost over. I’ll need to do something else very soon. I’m thinking about launching a new series: possibly some portraits made of small pieces of colored crumpled paper. I’d also like to bring in some music to my graphic universe. I don’t know how exactly, this is my new challenge. 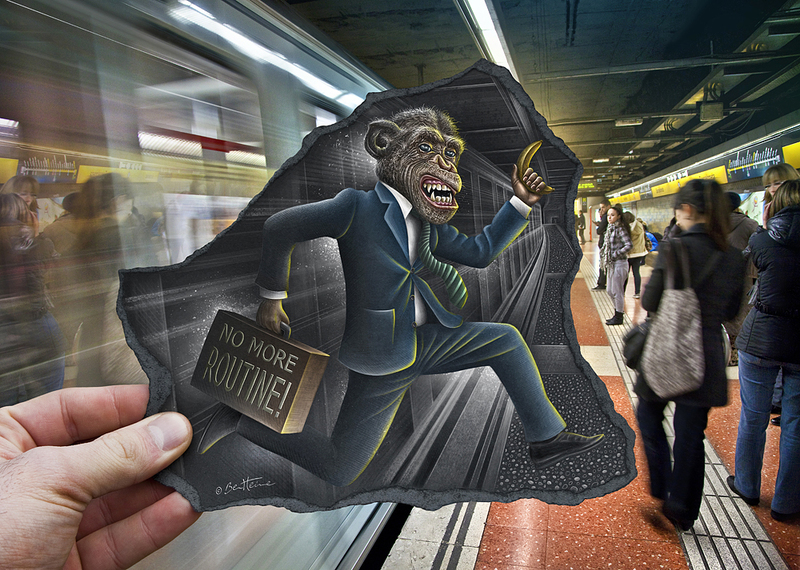 See before & after examples of Ben Heine’s work.